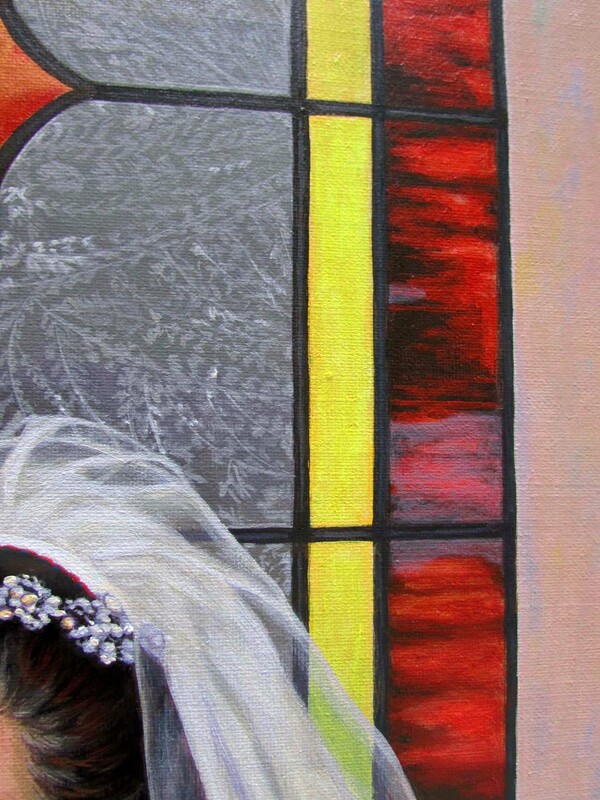 Painting the image of stained glass and specifically the glue chip glass is a visual illustration of something that requires patience. Sometimes progressing in our artistic skills and abilities boils down to exercising patience. In an instant technology-rich culture, growing in the character quality of patience doesn’t seem productive. We hear the phrase a lot in leadership circles to not work harder, but to work smarter. While that has value under some circumstances, the stretching of our intellect and character through growing in patience has great value for our art and even greater value for our lives. I will be the first to say I have a long way to go in cultivating the quality of patience. I am still learning. I am given multiple opportunities on any given day to exercise patience, so evidently I need to learn how to have more! The stained glass pictured up above, and specifically the glue chip (bankers glass) depicted in the painting took me time, a magnifying glass, a lot of observing and a good dose of patience!Patience is something we have great opportunity to learn in life on a continual basis. Some people like to say, “I have no patience,” or “I’m not a patient person,” as if that excuses them from having to exercise patience. We are given trying circumstances to learn patience, and developing our art sometimes is one of those circumstances. Do have patience with the process, have patience with yourself, and most importantly we learn that in having patience with others, we really have the opportunity to grow. This benefits us in our art, and more importantly in our lives.